Dr VJ Vadgama, likes to be called V.J. He is the best dentist I have ever visited. I trust him implicitly. He is a consummate professional, loves his work, pays attention to detail, invests in his practice, has all the latest equipment and keeps up to date with all new techniques. It is a pleasure to visit him, as he makes you feel comfortable and a ease. He explains what he is going to do, before inviting you to sit in the dentist chair. He manages to keep up a one way conversation while he works, so no awkward silences or wondering what he’s doing. I have had extensive work done, 6 implants so far, crown and veneers. VJ always ensures that you have the necessary medication for whatever procedure he is about to undertake, so that you are never in pain. “In 2001, I came to see Dr Vadgama, on the recommendation of a friend. Due to an accident as a child, my poor front teeth were dentures (on a bridge). The problem I had was that the centre line was off by quite a lot, which I found humiliating when I smiled. The treatment Dr Vadgama recommended was to put implants and a new bridge in to create a new centre line. 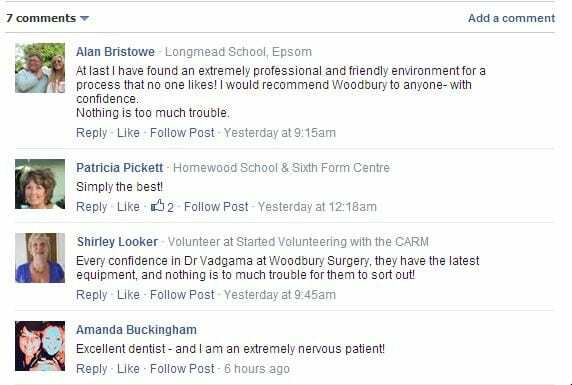 Even though dental work is quite intrusive and sometimes stressful, I have always felt completely confident in Dr Vadgama on a professional level and put at ease by his very warm and friendly approach. 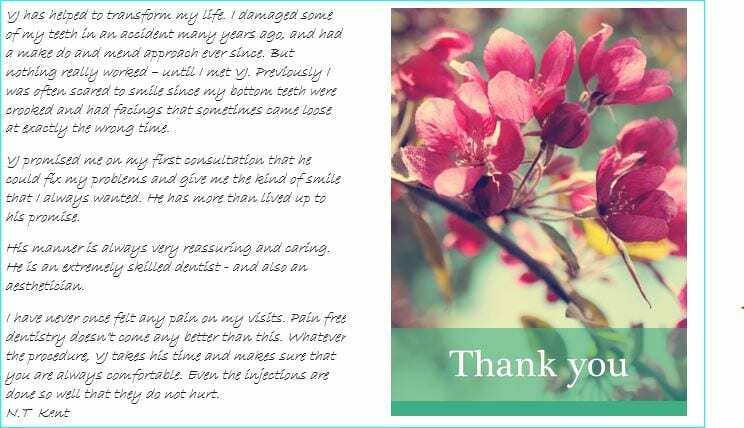 Just a short not to say that after having implant treatment in 2006 completed, I am very pleased with the service you gave me. Long may it reign. “As a teenager, every visit to the dentist seemed to involve pain, drilling and filling. As an adult, sensitive, decaying back teeth caused discomfort when eating, prompting regular feelings of regret that I had not looked after my teeth. Retirement from the teaching profession gave me the time to follow up a recommendation to consult Dr V J Vadgama. From the very moment I entered his pristine practice, the confidence to trust him with my problems just grew and grew. 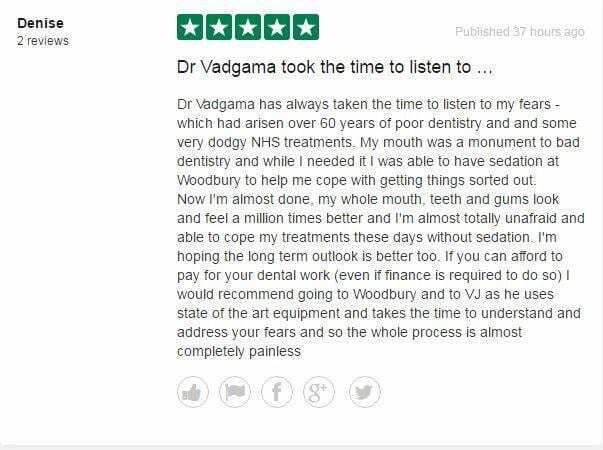 The warm and caring approach, together with the consummate skill, knowledge and experience of Dr Vadgama set me on the road to recovery. He has changed my life. I now have twelve fully restored back teeth with not a filling in sight. I can eat food which is very hot or very cold without flinching and I now treasure each tooth as a friends to be looked after! The cost of private fees was, frankly, quite a shock initially but I reviewed my priorities accordingly. I had the chance to remedy my teenage carelessness, thus enhancing the quality of life in retirement. The true value of my decision to go ahead with the treatment plan gives me joy, every day, every meal.